What once seemed so futuristic has become almost commonplace: the smart home. With a few swipes on your phone, you can turn on the porch lights and crank up the air conditioner before you even arrive, thanks to smart technology (can we have dinner prepared, please?). The days of hauling hoses and hooking up sprinklers are giving way to the ease and efficiency of in-ground irrigation systems to keep plant life thriving. Add smart technology, and you can operate the central controller unit (which programs the time, location, and duration of watering, etc.) through your phone — even when you’re away from home. 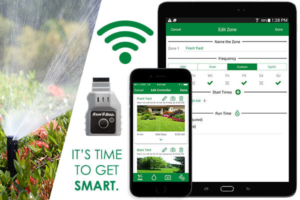 In addition to the factors programmed into the controller, the app also connects to GPS-enabled weather data to deliver the right amount of water to specific zones around your property. There are irrigation kits you can pick up at the big box stores if you’re a do-it-yourselfer. But there are many factors to consider when installing a sprinkler system where professional advice is warranted. (Drainage, coverage area, water pressure, and zone identification, to name a few.) Plus, you’ll want to take full advantage of the capabilities made available by technology for your lawn and garden. We’re here to help you — and your yard — become smarter. Contact us at 763-398-0739.